World of DTC Marketing gives us the brilliant matrix above (really, just take a second to digest it) which explains the migration of attention and content. 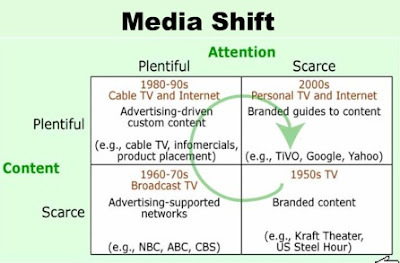 In a world of lots of choice, and little attention, the media plan has to change. Industries steeped with older execs and the plans of yore, such as pharma and healthcare, are often the most resistant to change … if they are not watching the customer data. Via Bill Green.